Size: 4.6" x 2.5" x 0.35"
This TI-1006 introduced late in the year 1982 seems to be identical with the Toshiba HB-103. We assume that the first production batch of the TI-1006 used a slightly different design and larger solar cells. The pictured calculator on the left box states "BATTERY FREE" and seems to have solar cells with 10 small elements. Later boxes showed smaller solar cells and stated "LIGHT POWERED" close to the type designation. We know similar changes from the early TI-1766. Dismantling the TI-1006 reveals indeed with Toshiba the manufacturer of at least the printed circuit board (PCB), please find the company logo on the left of the Toshiba T6789S single-chip calculator circuit. The printed circuit board (PCB) carries not only a calculator chip manufactured by Toshiba, the Toshiba brand is etched into the copper of the board. The odd key spacing of both calculators was corrected with the TI-1706 introduced one year later. Please notice on the right picture the different size of the TI-1006 and its successor. This proofs the TI-1706 isn't just a stylish variation of the TI-1006, it's a complete different product. Compare some other TI calculators with their sibblings manufactured by Toshiba. 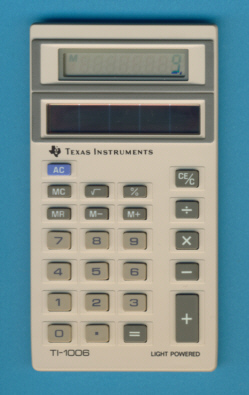 The TI-1006 is featured in the Texas Instruments Incorporated leaflet CL-199M dated 1983.